At my new job, I’ve been getting a lot of questions in regards to my age. Not in a bad or discriminatory way of course. But people can’t seem to pin me down for a certain age group. Part of me thinks maybe I act really immature and that’s why they think I’m such a youngster. But I realize now that a big part of it is how I take care of my skin. This is a picture of me from not too long ago. It hasn’t been retouched, hasn’t had any crazy good Instagram filters applied to it, and besides a little eyeliner I’m not wearing any makeup. Sounds too good to be true, right? But I digress. This photo is here to show you that you CAN look great and feel great, and, most importantly, you don’t need a filter or crazy amounts of makeup to reveal your inner glow. So what’s my secret? Here are the top four natural and healthy tips I’ve developed over the years to keep me looking young and fresh. They don’t require needles, surgery, or crazy expensive products. At the end of the day, it all comes down to the kinds of foods and drinks you put into your body. Check out these simple ways to slow down aging and look youthful! 1. Vitamin A—Most people have overlooked this vitamin, instead focusing on specific antioxidants like resveratrol to look younger. But vitamin A actually plays a key role in collagen production, which is basically the stuff in your skin to keep things taut, firm, and wrinkle-free. In fact, did you know the retinol medications you get from your dermatologist are actually derivatives of vitamin A? I’ve noticed over the years that when I incorporate lots of vitamin A-rich foods in my diet, my skin looks more rested. It’s less red, blotchy, and even fine lines I had developed in my early twenties have actually gotten better as I approach my mid-twenties. That’s why I’m definitely a fan of root veggies like sweet potatoes, yams, and butternut squash. Today’s recipe actually is my secret anti-aging breakfast. It might sound unconventional, but it definitely keeps me full all morning long, helps me manage my weight, and is loaded with vitamin A! 2. Lemon/Lemon Water—You’ve probably already heard how essential water is for hydration. You’ve probably also heard about the amazing benefits of lemon water. I’ve been drinking lemon water for about the last 10 years, and it definitely has become part of my daily routine. I’ve heard routines/recipes recommending drinking warm lemon water upon rising. But I realize this isn’t practical for everyone. My solution? Drink from a recyclable water bottle throughout the day (BPA-free of course). Throw in half a lemon each day. You don’t need to squeeze the juice into the water or get all fancy with things. Simply half a lemon thrown into your water bottle is more than enough. This way as you refill your bottle throughout the day, you’ll reap the benefits of detoxification, vitamin C, and a youthful glow. If you’re really interested in starting your day with hot lemon water, check out this antioxidant-rich lemon goji water I posted a while back. Also remember you don’t need to drink lemon water to reap the benefits! Throw lemon juice in a soup or squeeze fresh lemon on salmon. These all count as ways to get lemon into your diet. 3. Coconut Oil—Coconut oil is another product that has become very popular in the natural health community, and from personal experience I definitely see why everyone is obsessed with this oil. Let’s get one thing straight. Coconut oil is not a miracle maker. You can’t eat chips and drink eight glasses of wine and smoke a pack a day and expect coconut oil to keep you looking young and healthy. With that said, if you’re already living a fairly healthy life, coconut oil can definitely help with keeping you young and provide other anti-aging benefits. There are all sorts of ways to work coconut into your life. You can use it as a cooking oil to help raise your metabolism/burn fat. You can oil pull with it. But my personal favorite is using coconut oil as a body moisturizer. I find it very effective at hydrating the skin, especially post-shower when my skin is still wet. I’m also not afraid of using coconut oil as a facial moisturizer, even during the day before applying makeup. As long as you work the coconut oil well into your skin, you shouldn’t have any problems with make-up application. Even if you have oily/acne-prone skin, I’ve noticed my skin has actually become MORE balanced with regular coconut use. Something about coconut oil’s antimicrobial properties have helped heal my acne and keep my skin even and clear. 4. 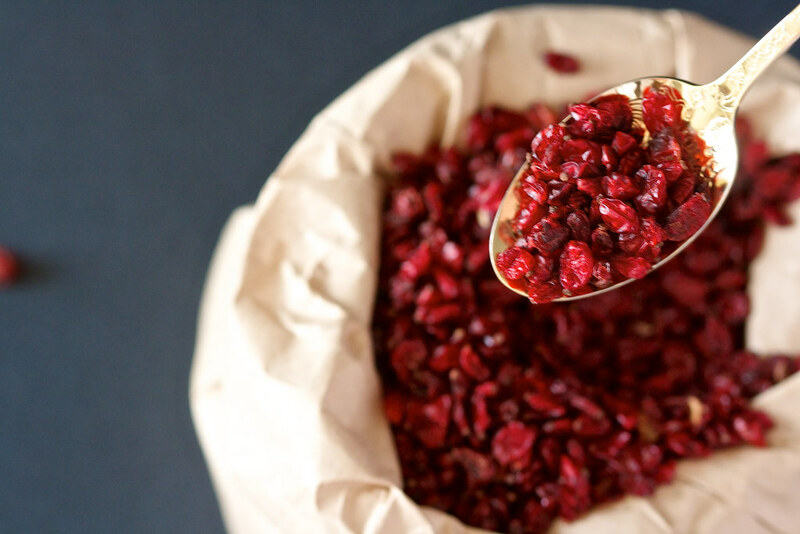 Barberries—Surely you’ve heard of goji berries, but have you heard of barberries? This super nourishing berry hasn’t become quite as popular as goji berries, but I wouldn’t be surprised if barberries become a trendy food in 2015. Besides being loaded with vitamin C, barberries are also fraught with antioxidants. These antioxidants help fight free radicals (i.e. oxidative stress), keeping you youthful and glowing year-round. Barberries are a staple of Persian cuisine, and I’m impartial to using them in dishes like Zereshk polo. Also, compared to other dried berries that can become quite expensive, barberries are much more reasonably priced. You can find them at a Persian/international grocery in the dried fruit section. Okay, so now for today’s recipe! Definitely try making this one morning. Ideally, I like to cook my sweet potatoes in the oven, but I realize this isn’t practical for most people. Using the microwave is a much more convenient option and I’m totally aware of that. I know it’s not perfect, but I’d rather you eat a microwaved sweet potato than a donut or a Egg McMuffin from McDonald’s. This recipe is loaded with antioxidants, vitamin A, vitamin C, and even some protein and healthy fat from the almond butter. Better yet, did you know adding fat to vitamin A-rich foods like sweet potatoes helps your body absorb more of the vitamin A?! Just a little food for thought! Also remember that this is just a suggestion of how you can eat sweet potatoes for breakfast. I invented this recipe using ingredients I just happened to have on hand. And I’ll be honest when I say every day my sweet potato breakfast is a little different. Try different nut butters and/or fruit combinations until you find the one you like best! Microwave (or bake) your sweet potato until fully cooked. If you're baking, I suggest doing this the night before for a fast and easy breakfast. Remove the sweet potato from the oven/microwave. Cut in half. Fill with almond butter, blueberries, and dried cranberries. Enjoy!